This is the first and the last time that I am addressing this conference. So, you can afford not to listen to me. However, as I had said in my inaugural speech, even if I were to be the Chief Justice for only one day, during that one day, I was determined to do what I honestly believe to be right. That includes saying what I honestly believe to be right and need to be said. Since this is the only conference that I will be chairing, I would like, as far as possible, to concentrate on the administration of justice rather than pure administrative matters. This is a matter of priority at this point of time. I believe that this Conference of the Council of Judges is required by law to be held at least once a year to discuss current legal issues and issues pertaining to the administration of justice rather than the size of the epaulet and the uniform of drivers even though I do not say that they cannot or should not be raised or discussed. We meet today under very different circumstances from what we used to do as far as I can remember. Not only the holders of the top three posts are new, the perceptions of the public towards the Judiciary, rightly or wrongly, are also different. We cannot deny that the Judiciary is now suffering from negative perceptions by the public. Ironically, it is not the result of what had just happened over the past few months. 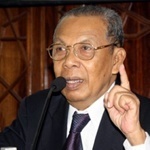 It is an accumulation of what have been happening or perceived to have happened over the past two decades, beginning with the dismissal of Lord President Tun Salleh Abas and the two former Federal Court Judges. Politicised to the hilt, the full effect is now felt and we bear the burden of trying to redeem those negative perceptions. The negative perceptions of the public towards the Judiciary are not caused by factors from within the Judiciary alone. They are also due to factors coming from outside the Judiciary that affect the Judiciary. So, to redeem the situation, both factors must be addressed. There have been talks about “reforming the Judiciary”. Personally, I am very reluctant to use such high-sounding word as “reform” for fear that, in reality, it may end up as described by the Malay proverb: “Indah khabar dari rupa”. So, I shall not use it. Others can use it. I prefer to pinpoint the specific causes and try to find solutions for them. First and foremost, the Legislature, the Executive and the Judiciary must respect each other’s jurisdictions. They must subscribe to and practise the doctrine of separation of powers as provided by the Federal Constitution. There must be mutual respect for each other’s jurisdictions. The Executive should not and should not appear to interfere with the decisions of the Judges. The Judges should be strong enough to resist any attempt to interfere with their independence, if such an occasion arises. As I had said in my inaugural speech, a lot depends on the Judges themselves: whether they are strong enough to maintain their independence. Speaking for the Judiciary, once the public is convinced that there is no interference by the Executive in the decisions of the Judges, half the battle is won. Next comes the role played by the Judges themselves. If the public is convinced that the Judges are independent, incorruptible, hard-working, fair and free from any vested interest, then, we are in the right direction in redeeming the situation. In this respect, the choice of persons to be appointed as Judges is important. As I said at Universiti Utara Malaysia, “Kalau tanam pokok pisang kelat, jangan harap akan dapat buah pisang emas”. We should apply the correct criteria in choosing them, such as integrity, knowledge, incorruptible, hard-working, fair, of good character and able to “buat kerja”. Judgeship is not a reward, not a semi-retirement, not a solution for a problem somewhere else. It is hard-work, honest hard-work. In this regard, lawyers, parties, the press and members of the public too have a role to play. Everyone has to be honest in dealing with the courts. The press should report fairly and accurately the judgments of the court. There are members of the public whose only concern is their personal interests. As far as they are concerned, the Court is right if it decides in their favor and wrong if it decides against them, irrespective of the law and the evidence adduced in court. The moment a Judge decides against them, they write malicious complaints against the Judge accusing him of corruption and bias. By tradition, Judges do not respond. Sometime, I wonder whether Judges, who are expected to ensure that everyone who appears before them be treated fairly and be given the right to be heard should not themselves have the same rights. Are they not “members of the public” too? Of course, I am not advocating a departure from the established tradition. Of late, we also hear suggestions for the establishment of a “commission” or “committee” (or whatever it is called) to vet candidates for the appointment of Judges and more senior posts. I have been asked many times for my view on the suggestion. Let me say it here. I take the stand that it is a policy decision for the Executive to make. If the Executive, in its wisdom, believes that it will help in identifying the right candidates, if it will help to redeem the negative perception of the Judiciary, if it will help to redeem the negative perception towards the Executive in the appointment of Judges, if it will help to regain the confidence of the public in the Judiciary and the Executive in relation to the Judiciary, why not? However, we must also ensure that the right people are appointed to the commission or committee. They themselves must be people of integrity, knowledgeable, incorruptible, fair and without any vested interest. They should not have an agenda of their own. Neither should they be the conduit for lobbying for the judgeship. Again, as I have said at the Universiti Utara Malaysia, whatever system we have, in the final analysis, it is the people who implement the system that matters. I have also been asked many times for my view regarding the proposed apology to the former Lord President, Tun Salleh Abas and the other two former Federal Court Judges. So far, I have refrained from giving any response. I know I will be asked again. Let me say it now and here. Again, it is a policy decision for the Executive to make. As far as I am concerned, if the Executive, again, in its wisdom, believes that it is a proper thing to do, I welcome it. After all, in that episode, the Judiciary was on the receiving end. I think it is important that we always bear in mind that, as Judges, while we judge people, people judge us. The public expects a high standard of honesty and integrity from judges. We are the last hope and the last frontier for the people. If they think, rightly or wrongly, that they cannot trust judges, who else can they trust? We all know what is right and what is wrong for judges to do or not to do. The question is, whether, in spite of that, we still do what we know we should not do and do not do what we know we should do. I cannot do more than to appeal to your good conscience to guide you. Of course, there may be cases where the law will have to take its own course. The nature of work of a judge is very difficult to measure. Statistics may not tell a lie but it may not tell the whole truth. But, when statistics are intentionally manipulated, it will never tell the truth. Furthermore, one case is not always equal to another case in terms of complexity and the amount of time required to dispose it. So, while statistics may give some indication of the amount of work a judge does, it is not a very reliable benchmark. Yet, it is about the next best thing that we have, provided it is honestly prepared. In any event, with or without statistics, those who are acquainted with the courts know who are really working and who are not. It is quite impossible to monitor who is doing what during office hours. Besides, some people are faster than others even in doing the same work and producing a similar quality of work. Actually, as judges, we do not need to be monitored by anybody. (We should be monitoring the subordinate court judges and the officers of the court.) We should know our responsibilities. We should be honest with ourselves as to how we spend the office hours. But, while we are quick to complain if our salaries are paid less or late, how often do we ask ourselves how much time we spend speaking on the telephone and out of that how many percent is about work? How much office time do we spend doing our work and how much on private matters? How much time do we spend lecturing lawyers and members of the public in open court over trivial matters or matters that should not even be an issue at all, and so on? Please search your own conscience. Recently, I nominated two Judges to attend two separate conferences abroad. They both, separately, requested that they be excused. I was touched by the reason they gave which turned out to be the same i.e. it was difficult for them to adjust their cases. It shows how concerned they were about postponing cases even when I was the one who nominated them to attend the conference. It shows their attitude towards their work. I am telling you this story not because I want to single out some Judges and praise them. Neither am I sending a message that when nominated to attend a conference or seminar locally or abroad that you should decline the nomination. (When I nominate any of you for such purpose, I know that cases will have to be postponed and that is excusable.) But, I am telling this story because I want the public to know that a majority of Judges are very conscientious about their work. Credit should be given where it is due. Judgments are something that every judge should be proud of. They are something very personal. They reflect our knowledge, our intellectual honesty, our analytical power, our ability to grasp the issues, our ability to think straight or otherwise, our ability to express ourselves clearly or whether we ourselves are confused, our command of the language, our style of writing, indeed our whole character. I do not understand why any judge would not want to be proud enough to produce his or her own literary masterpieces. I am told that in the United States the clerk of a judge drafts the judge’s judgments. I do not know how the system works and I pass no judgment on it. But, in our present context, I do not think it is a practice that we should adopt. Besides what I have said, from experience, when we are writing the judgment ourselves, we will be more meticulous in examining the evidence, the law and the arguments. We will see points which did not cross our mind before. If it is our research officer who puts up the draft, how does he make our observation of the witnesses’ demeanor? When the judgment is written for us, there is a great temptation for us to merely place our signature to reduce the statistic of unwritten judgments. It may even encourage corruption on the part of the officers who put up the judgments. Why require an experienced person to be appointed a Judge and pay him a high salary if the most important work of the job is going to be done by a junior officer who could be paid less? When a research officer puts up the judgment, the quality of work that will come out will be that of a junior officer, unless he or she is better than the Judge, in which case he or she should be the Judge. In any event, think of the perception of the public, what more the losing party who may lose his life, liberty or property! I think it is a dereliction of duty for a Judge to ask someone, including his or her research officer to draft his or her judgment, and it is a misconduct to get someone, including his or her research officer to write it for him of her. A Judge who writes a judgment for another Judge, a Judge whose judgment is written by another Judge and a Judge who allows himself to be influenced by another person in arriving at his decision, commits a misconduct. I know, I cannot tell you what decision to make in a case and what to say in your judgments. However, I believe that I am entitled to state my views as a general observation for your consideration. When a provision of the written has been in the statute book for decades and the courts, including the apex court had repeatedly considered and consistently ruled on the provision, we should, as far as possible, not change the interpretation. If a change to the law is needed, let it be done by the Legislature. We should learn from the two previous experiences. Remember the “beyond reasonable doubt” and “prima facie” fiasco. The Criminal Procedure Code had been there for decades. Courts had consistently ruled what the test was. Even a first year law student had no problem understanding it. Then came Hua Tua Tau, a Privy Council judgment in a jury trial from another country. We adopted it. That too became established law. Then we decided to revisit it. We went back to the “beyond reasonable doubt” test. All these while, the provisions of the law in the statute book remained the same. But we kept giving different meanings to it. Perhaps, the learned Judges who decided to go back to the “beyond reasonable doubt” test, thought that it was merely a change of password and did not realize the serious and massive implications that it would cause. As a result tens, if not hundreds, of cases were affected: accused persons were either acquitted or have the charges against them reduced. It was not so much because the convictions could not be supported by evidence but because a wrong phrase treated as a “password” was used. The Legislature had to intervene. While that fiasco was quieting, there came another one: the courts, including the apex court, were wrong all these years: there cannot be “double presumptions”. You all know the effects. Regarding “double presumptions”, my question is, what is the reason behind the new thinking regarding the meaning of the provision of the law that has been there for decades and so interpreted for decades? It may be that “a more learned Judge” suddenly sees something in the wording of the provisions that other judges had not seen. Or, as one retired judges said, it was a reaction of the court to the mandatory death sentence provided by the law. If it were the former, it would be quite acceptable, except that, unless the previous judges had been glaringly wrong, I think we should be very slow to upset the long-standing interpretation. But, if it were the latter reason, I do not think it is a valid reason. We should know our function. Whether we like the law or not, whether we think it is harsh or not, if the law is a valid law, it is our function to apply it. No Judge is a parliament. I am of the view that where a law has been there for decades and has been interpreted in the same way again and again for decades, judges should be very slow to upset the interpretation. There is a case for continuity and certainty, what more when it leads to serious, unwarranted and unforeseen consequences. We respect judgments of courts in other jurisdictions. But, I do not think that judges should merely cite passages from judgments of courts in other countries and blindly follow what they say. We should look at the context in which it is said. We should look for the ratio of the case considering the facts of the case and the written law of the country. A judgment of the House of Lords in England may not only be based on the laws of England but also the various European Union Conventions that England is a member. Malaysia is not a part of England, nor a member of the European Union. The provisions of our written law may be different. Our local circumstances and public policy may be different. We must always bear all these factors in mind. Perhaps facilitated by modern technology, I see more and more cut-and-paste judgments. Passages are lifted up and pasted on the judgment without considering the facts and the ratio of the case. As a result the law gets extended further and further and, at times, at the expense of the provisions the statute. At times, even the whole of the law firm’s letter-head, together with the names of all the partners and the assistants and the telephone numbers of the firm, is reproduced in the judgment. Whatever for? Recently, I spoke about the so-called “development” of administrative law in Malaysia in particular in relation to Industrial Court awards. I am not going to repeat it. I am only bringing it to your attention for you to think about it. I don’t even say that I am right. Relating to this issue too, is the part played by the court in regard to arbitration. Arbitration was introduced with a view to speedy and (hopefully) less expensive settlement of disputes. It is the in-thing now and a big business in many countries, including our neighbor, Singapore. Recently, when attending a conference in Abu Dhabi, the Chief Justice of Singapore told me that the number of cases filed in the courts in Singapore has declined significantly. I asked him for the reason. He said, “Arbitration.” Mind you, that is in spite of the fact that Singapore courts, comparatively, dispose of cases much faster than our courts. The new Arbitration Act 2005, which is based on the UNCITRAL Model Law defines the limited area in which a court has the power to intervene in arbitrations. This is in line with modern jurisprudence throughout civil law and common law systems. The Act also creates a distinction between domestic and international arbitrations giving the Court wider power to intervene in domestic arbitrations than in international arbitrations. However, domestic parties can opt for the international regime and vice versa. Judges should always bear in mind that whether under the old Act or the new Act, the Court’s jurisdiction over arbitrators and arbitrations is statutory and that Courts do not have the power of judicial review to regulate or supervise the arbitral process. One of the most common complaints by parties who have experienced arbitrations is the long process the winning party must go through again in court to realize the sum awarded. Judges should take a robust stance on enforcement of arbitral awards to discourage unmeritorious parties from delaying and abusing the processes of Court and bringing the arbitration process into disrepute. Efficient handling of arbitration cases will also help project Malaysia’s image and the image of our judiciary in the international arena. Singapore and Hong Kong have made their mark and are becoming preferred centres for arbitration. There is no reason why Malaysia cannot do the same. A major factor considered by international parties when negotiating arbitration clauses in their contracts is the quality and speed of judgments delivered by judges in the country which is chosen as the seat of the arbitration and whether those judgments support the arbitral process. It is thus essential that judges treat arbitration cases, particularly cases where there is an international party involved, with some priority and deal with them expeditiously. Islamic banking, Islamic finance and takaful is a multi-billion dollar business. Countries, all over the world, Islamic or un-Islamic, are going all out to attract the overflowing petro-dollars by offering Islamic financial products. Malaysia is in fact among the big players in the industry. But other countries, including Singapore and Hong Kong, are catching up very fast. One of the issues that arise is the competency of the courts in determining the Islamic law issues arising from such transactions. (Thank God, not many such issues have arisen in our courts so far.) In Malaysia, the Government had considered the limitations of the various institutions, e.g. the civil court, the shari’ah court, the National Fatwa Committee and the State Fatwa Committees and had decided to establish the Shari’ah Advisory Council at the Central Bank (Bank Negara) for such issues to be referred to for decision if and when they arise. Islamic law issues in Islamic banking, Islamic finance and takaful are complex issues. To determine such issues, knowledge of Islamic law, civil law, conventional banking, finance and insurance is necessary and, very often, it involves the exercise of “ijtihad”. It requires a group of experts in the various relevant fields to sit together, try to understand the technicalities of the product, identify the parts that may attract “shari’ah issues” before applying the principles of shari’ah (or fiqh) before arriving at the conclusion, which, very often, requires the exercise of “ijtihad” by the experts. It not something that a common law judge or even a shari’ah judge or even an ulama’, citing a few verses of the Al-Qur’an, can determine. So, I would urge all of you, if faced with such issues to refer the issues to the Syari’ah Advisory Committee for a ruling. That is provided by law. For your information, the setting up of the committee has been internationally recognized as a positive step in the right direction in which Malaysia is the leader and, I am told, Pakistan has followed suit and even Saudi Arabia is considering to follow our example. Besides, Malaysian Government has spent and is spending millions of Ringgit to make Malaysia the hub of Islamic banking, Islamic finance and takaful. Let us not spoil it through out ignorance and misplaced confidence. In this conference, besides inviting Duli Yang Teramat Mulia Raja Dr. Nazrin Shah Ibni Sultan Azlan Muhibbudin Shah, the Regent of Perak to speak to us, we are also having a 4-cornered forum consisting of the Judiciary, the Attorney General, the Police and the Anti-Corruption Agency. The purpose is to enable the four agencies to interact with each other in order to find solutions to our common problems in the administration of criminal justice. The administration of criminal justice is not the responsibility of either of these agencies alone. On behalf of the Council of Judges, I would like to place on record our appreciation for the services of the former Chief Justice, Yang Amat Berbahagia Tun Dato’ Seri Ahmad Fairuz Bin Dato’ Sheikh Abdul Halim to the Judiciary. I also extend our appreciation to two other Judges who had retired since the previous conference, namely Yang Berbahagia Dato’ Azmel Bin Haji Maamor, Judge of the Federal Court and Yang Berbahagia Datuk Mokhtar Bin Haji Sidin, Judge of the Court of Appeal. Indeed, we invited them to the conference dinner but, unfortunately, they are unable to make it. In any event, we wish them well and hope that they will enjoy their retirement from the Judiciary for a long time to come. I also take this opportunity, on behalf of the Council of Judges, to convey our condolence to the widow and members of the family of Allahyarham Dato’ Abu Mansor Bin Ali, former Federal Court Judge. The late Dato’ passed away last week. We pray that Al-Mighty God will shower His blessings on his soul. I welcome you all and your spouses to the conference. I hope we will have a fruitful discussion besides renewing and strengthening our friendship. I hope you will enjoy your stay even though we did not provide you with much entertainment this time and I apologize in advance for any short-comings.